Readers are expected to be familiar with programming concepts and Python (where possible Python 3 is used), although beginners should manage with the help of a good Python reference book and background reading. No prior knowledge of the Raspberry Pi or electronics is required; however, for the hardware sections you will need some basic electronic components/household tools to build some of the projects. Raspberry Pi for Python Programmers is a practical guide for getting the most out of this little computer. 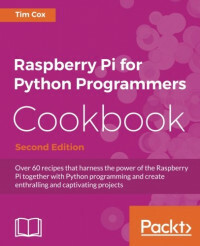 This book begins by guiding you through setting up the Raspberry Pi and performing tasks using Python 3, and introduces the first steps of interfacing with electronics. As you work through each chapter, you will build up your skills and knowledge and apply them as you progress through the book. Later, you will learn how to automate tasks by accessing files, build applications using the popular Tkinter library, and create games by controlling graphics on screen. You will harness the power of the built-in graphics processor by using Pi3D to generate your own high quality 3D graphics and environments. And you'll learn how to monitor sensors to gather real-life data and use it to control other devices, and view the results over the Internet. Experiment using the Raspberry Pi camera module, including real-time image processing using the powerful OpenCV library. Finally, we will explore using many of the purpose built add-ons available for the Raspberry Pi, as well as interfacing with common household devices in new ways.